The birth of Jesus was the most astounding thing that ever happened to this earth. Nothing like it had ever happened before. Nothing like it could ever happen again. The High and Holy One, who dwells in light unapproachable and majesty incomprehensible, became a member of the human family. The Creator of heaven, earth and the galaxies of limitless space, was born of a woman, grew up in a humble peasant home, traveled about as an itinerant preacher, died in ignominy and shame, rose from the grave and ascended to heaven. The twelve apostles were chosen eyewitnesses of these things. Then the ascended Christ chose another man through whom the Holy Spirit would show the real meaning of those historical events which the twelve apostles witnessed. It is in Paul that the gospel, given to the Hebrews in types, shadows and promises, is fully revealed (Col. 1:26; Eph. 3:5; Rom. 16:25, 26; 1 Peter 1:10-12; Heb. 1:2). The full disclosure of the gospel was committed to Paul's trust (Col. 1:25-27; Eph. 3:8; Gal. 1:12; 1 Tim. 1:11; 2Tim. 2:8; Titus 1:3; 1 Cor. 3:10; 2 Cor. 12:1-5, 12; Rom. 16:25-26). Colossians 1:25-27 25 of which I became a minister according to the stewardship from God which was given to me for you, to fulfill the word of God, 26 the mystery which has been hidden from ages and from generations, but now has been revealed to His saints. 27 To them God willed to make known what are the riches of the glory of this mystery among the Gentiles: which is Christ in you, the hope of glory. 1 Peter 1:10-12 10 Of this salvation the prophets have inquired and searched carefully, who prophesied of the grace that would come to you, 11 searching what, or what manner of time, the Spirit of Christ who was in them was indicating when He testified beforehand the sufferings of Christ and the glories that would follow. 12 To them it was revealed that, not to themselves, but to us they were ministering the things which now have been reported to you through those who have preached the gospel to you by the Holy Spirit sent from heaven -- things which angels desire to look into. Galatians 1:11-12 the gospel which was preached by me is not according to man. 12 For I neither received it from man, nor was I taught it, but it came through the revelation of Jesus Christ. 2 Corinthians 12:1-12 It is doubtless not profitable for me to boast. I will come to visions and revelations of the Lord: 2 I know a man in Christ who fourteen years ago -- whether in the body I do not know, or whether out of the body I do not know, God knows -- such a one was caught up to the third heaven. 3 And I know such a man -- whether in the body or out of the body I do not know, God knows -- 4 how he was caught up into Paradise and heard inexpressible words, which it is not lawful for a man to utter. 5 Of such a one I will boast; yet of myself I will not boast, except in my infirmities. 6 For though I might desire to boast, I will not be a fool; for I will speak the truth. But I refrain, lest anyone should think of me above what he sees me to be or hears from me. 7 And lest I should be exalted above measure by the abundance of the revelations, a thorn in the flesh was given to me, a messenger of Satan to buffet me, lest I be exalted above measure. 8 Concerning this thing I pleaded with the Lord three times that it might depart from me. 9 And He said to me, "My grace is sufficient for you, for My strength is made perfect in weakness." Therefore most gladly I will rather boast in my infirmities, that the power of Christ may rest upon me. 10 Therefore I take pleasure in infirmities, in reproaches, in needs, in persecutions, in distresses, for Christ's sake. For when I am weak, then I am strong. 11 I have become a fool in boasting; you have compelled me. For I ought to have been commended by you; for in nothing was I behind the most eminent apostles, though I am nothing. 12 Truly the signs of an apostle were accomplished among you with all perseverance, in signs and wonders and mighty deeds. Paul's gospel theme was Christ and Him crucified for the justification and forgiveness of sinners (1 Cor. 2:2; Gal. 1:4). Of course, the other apostles also bore witness to the salvation of sinners through Jesus, but Paul shows how the gospel is a revelation of the righteousness of God (Rom. 1:16, 17). How could a just God justify sinners? How could God's holy law be vindicated and its integrity maintained if God remitted a rebel's punishment? How is the extension of mercy to law breakers consistent with the claims of divine justice? These are not just interesting questions. They must be answered if estranged man is to be reconciled to the character of God. The key word in Paul is justification. In both the Old and New Testaments the words justify and justification have a very definite legal and judicial meaning. They are words closely related to the idea of trial and judgment (Deut. 25:1; 1 Cor. 4:3, 4; Matt. 12:37). Justification may be defined as being declared just by court order. When God is said to justify a man, it means that He has brought the case to trial before His divine judgment seat and, after examining the case, has pronounced the accused as free of all fault and blame, as altogether righteous and pleasing in the sight of His holy law. In modern English, the word acceptance and forgiveness would also convey the meaning of justification. If justification means being declared righteous before the bar of the most infinite justice, who then can be justified? Alas! "How can man be justified with God? Or how can he be clean that is born of a woman?" "What is man, that he should be clean? And he which is born of a woman, that he should be righteous? Behold, He putteth no trust in His saints; yea, the heavens are not clean in His sight How much more abominable and filthy is man, which drinketh iniquity like water?" Job 25:4; 15:14-16. In his great epistle to the Romans, the apostle sets out to answer the universal cry of the human heart, "How . . . can man be justified with God?" Job 25:4. If that question means, "What can I do that will cause God to accept me?" Paul's answer is emphatic: There is absolutely nothing anyone can do to earn the forgiveness of sin and eternal life! Before the apostle presents God's way of reaching man, he exposes the futility of man's way of reaching God. Paul emphatically declares that no one is righteous, no one understands, no one seeks God, no one does good!! "As it is written: "There is none righteous, no, not one; There is none who understands; There is none who seeks after God. They have all turned aside; They have together become unprofitable; There is none who does good, no, not one." Rom. 3:10-12. "Now we know that whatever the law says, it says to those who are under the law, that every mouth may be stopped, and all the world may become guilty before God. Therefore by the deeds of the law there shall no flesh be justified in His sight." Rom. 3:20. Paul does not simply say that no one can become (future tense) just in God's sight by his performance. He uses the future tense of the verb. He means that no mortal man will ever be considered just on the basis of his own life!! No man can confront the judgment of God with an easy conscience if his standing rests upon the quality of his own life. The reason is very plainly stated: "For all have sinned, and continue to come short (In the Greek, the verb for “come” is in the present continuous tense) of the glory of God." Rom. 3:23. Or as Solomon declares, "There is not a just man upon earth, that doeth good, and sinneth not." Eccl. 7:20. "Being justified freely by His grace through the redemption that is in Christ Jesus: whom God hath set forth to be a propitiation through faith in His (Christ's) blood, to declare His (Christ's) righteousness for the remission of sins that are past, through the forbearance of God; to declare, I say, at this time His (Christ's) righteousness: that He might be just, and the justifier of him which believeth in Jesus." Rom. 3:24-26. These three brief verses contain the meat of Paul's gospel. They are wonderful in brevity and amazing in scope. The rest of the epistle of Romans may be regarded as an expansion of these three verses. Notice how these verses cover justification from three aspects: by grace. by Christ, and by faith. Here we view the saving activity of the three Persons of the Godhead: God the Father justifies us by His unmerited grace, God the Son justifies us by giving His sinless life to die in our place, and God the Holy Spirit enables us to personally accept it by giving us faith. "Being justified freely by His [the Father's) grace ..." Grace means mercy and favor shown to one who is lost and undeserving. In order to guard the absolute gratuitous nature of justification, Paul says that sinners are justified freely by God's grace. The word "freely" means "without a cause". No amount of obedience to God's law or character building ever causes God to regard a man as just in His sight. Someone has appropriately said that justification by grace means the divine acceptance of unacceptable people. It is most important to notice also that Paul is not just talking about becoming justified at the beginning of the Christian life. He uses the present continuous tense of the verb, "Being justified”. This includes the state of remaining justified as much as the act of becoming justified. This means that we can never get beyond justification by grace. We can remain in God's favor only by pure unmerited mercy. Grace finds us sinners, and we remain justified just as long as we remain sinners in our own eyes. If at any time we could stand acceptable before God because of our obedience, or moral excellence, or character building it would no longer be justification by grace alone. We must also understand the way grace operates to make sinful man acceptable in the sight of God. The way of our justification is said to be "through the redemption that is in Christ Jesus [through His act of liberation in the person of Christ Jesus, N.E.B.]." Rom. 3:24. We are also said to be justified "by His blood." Rom. 5:9. The doing and the dying (His sinless life and atoning death) of our Lord Jesus Christ constitute the only basis of our acceptance with God. He became the divine Substitute and Surety for us poor, lost sinners. On our behalf He gave to the law an obedience that measured with its infinite claims. On our behalf, by His own dying agonies, He paid to God's law the debt due to our transgressions. Christ's active obedience (His sinless life) and Christ's passive obedience (His atoning death) were altogether sufficient to secure the justification of every repentant sinner who puts his faith in Jesus. Says the apostle, "As One has died for all, then all have died." 2 Cor. 5:14, Moffatt. As far as divine justice is concerned, it can look at the cross of Christ and regard every repentant sinner who puts his faith in Jesus as having died, as having fully satisfied the claims of the law. This is so because Christ is the Substitute for everyone who believes. The believer's justification has been secured. The resurrection of Christ is the proof that God has already accepted and forgiven us in the person of His Son. He has taken us into His favor in the Person of His beloved Son. Eph. 1:7, Knox translation. This mighty act of reconciliation was provided for us in Christ while we were still ungodly (Rom. 5:6), while we were yet sinners (Rom. 5:8) and when we were still God's enemies (Rom. 5:10). This raises the question, "Did God accomplish our redemption by doing something that was completely outside of us?" Paul's answer is an emphatic Yes! And he proceeds to prove it by contrasting Adam and Christ (Rom. 5:15,19). His point is this: When Adam disobeyed, condemnation and sin passed upon the whole human race. This was so because he was our father. When he fell, everyone fell. Condemnation came upon us not because of what we did, but because of what Adam did (v.18). "For by one man's disobedience many were made sinners" (v.19). Thus we became sinners not by something that happened in us, but by something that happened completely outside of us. God has provided salvation to the race by giving us another Father, even Jesus Christ (Isa. 9:6). Just as all were condemned by what Adam did, justification has been provided and is offered to all by what Christ did. "By the righteousness of One the free gift came upon all men unto justification of life." Rom. 5:19. " For as by one man's disobedience many were made sinners, so also by one Man's obedience many will be made righteous." So it is forever certain that the only meritorious ground of acceptance with God is what Christ has already done for us at Calvary. Christ and Christ alone was found pleasing in God's sight. There is one reason for our acceptance with God—Christ's sinless life and atoning death have been accepted. His obedience of two thousand years ago is the only ground of our acceptance with God today. As far as God is concerned, at the cross Christ has paid the price of redemption for the entire sinful world just as surely as Christ has been raised from the dead and ascended into heaven to present us as faultless before God's throne of grace. At the cross God has made provision for the redemption of the entire human race in Christ. In the light of the gospel, we cannot ask such questions as, 'Will God accept me?" God has answered that question by the resurrection of Christ from the dead. But God confronts the sinner with the question, "Will you accept your acceptance in Christ?" Faith is our saying "Yes" to God. It is accepting the fact that we have been accepted in Christ. By it the blessing of justification and forgiveness is received and enjoyed. This is the subjective aspect of justification. Having saving faith in the shed blood of Christ for our acceptance with God is the only way for the repentant beliving sinner to be assured of the forgiveness of ones sins and eternal life. Thus the apostle declares, "A man is justified by faith without the deeds of the law." Rom. 3:28. We are not justified because of or on account of faith. That would be contrary to justification by grace alone and by Christ alone. There is no merit in the faith. It is merely the hand that accepts Christ as our Savior and Lord. Neither can the justified soul take any credit for faith. Apart from grace the sinner has no free will, no desire to seek God, no way of seeing the truth. Here is where the third Person of the Godhead acts in the matter of justification. Through the proclamation of the gospel, the Spirit brings conviction of sin, of guilt, and condemnation to the heart of the sinner, and then shows him the cross of Calvary and draws him to Christ in repentance for sin. It is the amazing grace and goodness of God revealed to us in the cross of Calvary that leads us to repentance. Romans 2:4 ....the goodness of God leadeth thee to repentance. Romans 2:4 .....God's kindness leads you toward repentance. As the sinner beholds the One who loved him and died on the cross to pay the price of his redemption, the Spirit persuades the sinner that the gospel is true. So Paul declares, "For by grace are ye saved through faith; and that (salvation) (is) not of yourselves: it is the gift of God." Eph. 2:8. On the other hand, to not believe is the sin of resisting the Holy Spirit. While the believer can take no credit for faith, the lost must take full responsibility for unbelief. No one is condemned for being born a sinner or for having a sinful nature. Men are condemned only because they believe not (John 3:36). Thus they refuse to be included in Christ's atonement, and by closing their ears against the gospel, they call God a liar (1 John 5:9, 10). In the fourth chapter of Romans the Apostle Paul shows how faith is counted for righteousness (Rom. 4:5). God imputes (or reckons) Christ's righteousness to the believing repentant sinner. In this way the sinner is declared to have right standing with God. The atonement for sin which was fully provided at the cross becomes the repentant believer's personal possession through faith on his part and imputation on God's part. Faith is counted for Christ's infinite righteousness, not because there is merit in faith, but because faith unites the repentant believer to Christ in whom dwells all the fullness of the Godhead (Col. 2:9). The sinner brings to the union nothing but the disgrace of need; Christ brings to the union all the treasures of eternity. God declares the believer to be forgiven of his sin and accepted into divine fellowship. "how I kept back nothing that was helpful, but proclaimed it to you, and taught you publicly and from house to house, testifying to Jews, and also to Greeks, repentance toward God and faith toward our Lord Jesus Christ." Acts 20:20-21.
so that we who are by nature dead in trespass and sin might call out, "What must I do to be saved?" 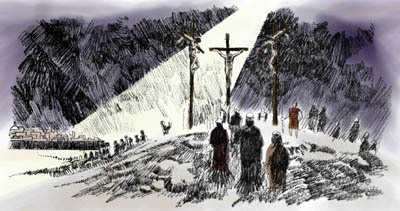 Without this drawing of the Holy Spirit and conviction of guilt none of us would ever be drawn to the foot of the cross with groans of repentance for our sins. Thus it is impossible that true faith in Jesus Christ can be a mere mental assent to the truthfulness of the gospel. True faith says, "Christ loved me! Christ died for me! O wretched man that I am! It was my sin that crucified the Son of God. Lord be merciful to me a sinner!!" We come to God just as the poor tax collector came. Justification by faith brings radical changes in the believer's life (peace, joy, love, regeneration, sanctification, obedience, etc.). Yet in this life it remains that the repentant believer is perfectly righteous only by faith in the imputed, reckoned righteousness of Christ, never by visible reality. It is his faith in Christ's sinless life and atoning death which is counted for righteousness, not his regeneration, sanctification, obedience or Christian character. Righteousness by faith means that the believer's perfect righteousness is not on earth, but in heaven; not in himself, but in Jesus Christ. Man can never find perfection or fulfillment in himself within the historical process. This is only realized in Jesus Christ. He is not on earth, but in heaven; and the believer possesses perfection and fulfillment only by the unmerited grace of God through faith alone in the sinless life and atoning death of our Lord Jesus Christ. Ephesians 1:13-14 In him you also, who have heard the word of truth, the gospel of your salvation, and have believed in Him, were sealed with the promised holy Spirit, which is the first installment of our inheritance toward redemption as God's possession, to the praise of his glory. but this is only the "first fruits of the Spirit," the down payment and pledge given until the day of final redemption (Rom. 8:22-25; Eph. 4:30). Romans 8:22-25 We know that all creation is groaning in labor pains even until now; and not only that, but we ourselves, who have the first fruits of the Spirit, we also groan within ourselves as we wait for adoption, the redemption of our bodies. For in hope we were saved. Now hope that sees for itself is not hope. For who hopes for what one sees? But if we hope for what we do not see, we wait with endurance. The possession of the indwelling Spirit does not lead the believer to feel that he has arrived or to think he can find satisfaction in his own experience. Rather the Spirit stimulates him with earnest longing for the day of Christ, when he shall receive an infilling of the Spirit not possible in this life. The doctrine of the second coming of Christ is a vital part of Paul's gospel message (Phil. 1:6; 1 Cor. 1:7, 8). Philippians 1:6 6 I am confident of this, that the one who began a good work in you will continue to complete it until the day of Christ Jesus. 1 Corinthians 1:7-8 so that you are not lacking in any spiritual gift as you wait for the revelation of our Lord Jesus Christ. He will keep you firm to the end, irreproachable on the day of our Lord Jesus (Christ). We might say that there are two great points in Pauline theology: justification and the parousia (the second coming of Jesus). The first calls for faith; the second calls for hope and endurance in the faith. The former we have now; the second is not yet. Possessing righteousness by faith, the believer waits, groans and presses toward the realization of righteousness by visible reality in the day of final salvation (Rom. 8:23; Gal. 5:5; Phil. 3:9-12). Romans 8:23 but we ourselves, who have the firstfruits of the Spirit, we also groan within ourselves as we wait for adoption, the redemption of our bodies. Galatians 5:5 For through the Spirit, by faith, we await the hope of righteousness. Whenever the truth of justification by faith has been taught and received, the hope and expectancy of Christ's soon coming has possessed the church. The apostolic church was aflame with the hope of the parousia. On the other hand, the loss of the truth of justification has led to a corresponding loss of eschatological (last-day) hope. During the Middle Ages, men looked to the church on earth as the expression of human fulfillment. There was no hope in the coming of Jesus. With the Reformation and a revival of the truth of justification, forgiven sinners again began to ardently look for and hope for the coming of Christ. And finally, in these last days the time has fully come for the truth to be restored to its rightful place. The message of Christ's righteousness must sound from one end of this earth to the other and thereby make way for the coming of Christ.